Tilbring fire timers touring Miamis hotspots og høydepunkter på denne utrolige byturen. Du følger en vennlig lokal guide til Art Deco Dristrict, Biscanye Bay og Brickell Avenue. Du vil passere forbi de fantastiske hjemmene i Coconut Grove, der Miamis elite tar opp seg. 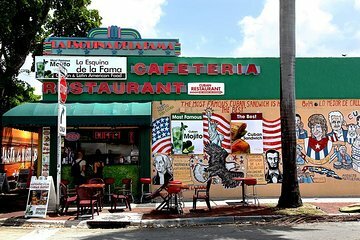 Denne turen inkluderer et stopp på Little Havana, hvor du vil se den cubanske påvirkningen og latinske smaken som har påvirket Miami kultur. Din virvelvindopplevelse treffer alle høydepunktene i minimal tid og er ideell for første gangs besøkende. Praktisk rundturstransport fra South Beach er også inkludert. Marcello was our guide and he did a fantastic job of giving us an overview of the city. He was knowledgeable and personable. The tour was in a van....not a bus.....and there were only 4 of us. 3 Spanish speakers and myself. Marcello was fluent in both languages and conducted the tour bilingually. Pick up was prompt. Can't recommend this tour more highly. We loved his tour. Oh My God! our Guide was so funny. He had us laughing the whole time and my boyfriend can be stone cold. We saw Miami - actually the real Miami and we got history and great conversation. Thank you so so much for a lovely way to end our Miami stay. Andre, our guide was very knowledgeable and experienced. His historical revelations were amazing and he gave a detailed and thorough tour of the Miami and environs areas. The car was comfortable and he was an excellent tour guide.